With Halloween around the corner, it is the perfect time to consider how the celebration of this particular day has influenced the fashion industry. Halloween, traditionally associated with darkness, evil, and the supernatural has, to a certain extent, influenced fashion, especially the Gothic style and has successfully created an aura of dark glamour. Gothic clothing embraces a dark colour palette similar to the conventional Halloween costumes worn today. One of the most popular Halloween costumes is Dracula, with his long cape, and vampire teeth, he is the ultimate scary character to impress your friends with. 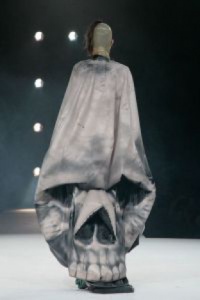 It is fair to state, however, that besides the Halloween phenomenon that the character of Dracula has created, he has also influenced both street style and high fashion. 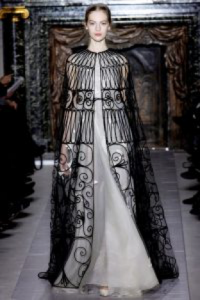 For example, Valentino’s spring 2013 Couture collection included a long black lace cape, as well as Manon Kundig at the Antwerp Fashion Department Show in 2011 whose cape was skull shaped, highlighting that the notorious style of Goth is the trademark dark cape. John Galliano, a British fashion designer emphasises the idea that Halloween has had an effect on the fashion of today when he stated the “Goth girl as edgy and cool, vampy and mysterious”. A trend of gothic style is the choker which is extremely popular today, with the majority of the high street stores selling them in their accessory collections. The choker has long had a rebel effect and gothic associations, but also is one of the key accessories to many Halloween costumes. A natural dripping blood choker is a popular demand over Halloween but the fashion industry has taken this and adopted it to a more universal style. For example, it is worn by Cher in Clueless or Mathilda in The Professional, to name a few. Halloween has also had a huge influence on make-up. On the 31st October many people will wear extremely dark eye shadow and black lipstick to match their dark and depressing outfits, but this look is not restricted to the specific celebration, instead, black lipstick and dark eyes are becoming a day to day make up choice for many. Kylie Jenner has also adopted the gothic appearance with the colour ‘Dead of Knight’ matte lip kit, which is a black matte liquid lipstick described as an ‘intense true black’ on her website. This Halloween, you can be ghoulishly gory with bewitching good style thanks to lace, sheer bodices, high necklines and dripping chokers. Halloween’s influence on fashion has made the gothic trend more popular and made dark glamour trendy and stylish.